Jennifer Aronson comforted her daughter Audrey, 5, during the Friday service at Temple Israel of Boston. They came by the hundreds, sang songs, laughed, prayed, and witnessed the ceremonial naming of a baby, one of their newest congregation members. “This is the way we move forward, with courage, and strength, intrinsically tied to one another by the kindness of humanity,” Rabbi Elaine Zecher told the 1,000-plus people in the cavernous sanctuary of Temple Israel, one of Boston’s largest synagogues and a beacon of social justice movements, where Martin Luther King Jr. once preached. 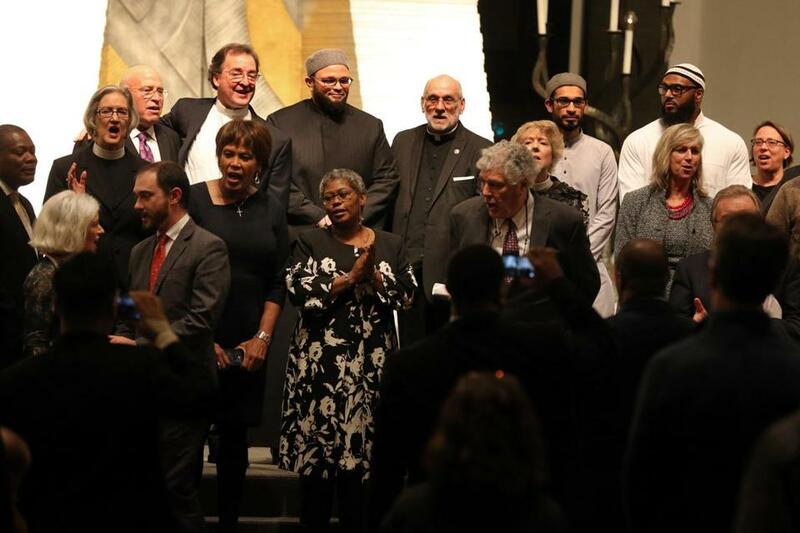 King’s message of hope laced the speeches of clergy and civic leaders, including Governor Charlie Baker, Mayor Martin J. Walsh, and Senator Edward J. Markey, who promised that Boston residents of all faiths would stand with their Jewish neighbors. It was meant to be a night of healing for the Jewish community following the shooting at Pittsburgh’s Tree of Life synagogue, which had also been holding a baby-naming ceremony. The calls for unity took on particular resonance in Boston, a city whose wounds of racial tensions were reopened in the past week when racist graffiti was spray-painted on the doors of a South Boston elementary school. Walsh, who spoke midway through the 90-minute service, urged city residents to stand strong against bigotry and racism, saying such hate and evil have begun to metastasize. “We must be reawakened as well. We must act with urgency, and faith, and love,” the mayor said, citing the Jewish tradition of keeping a door open at a time of grief and mourning, to welcome a spirit of love. “That’s what we’ll do in Boston, we keep the door open,” the mayor said. Baker spoke of the Founding Fathers, of how President George Washington reassured the Jewish community in a visit to Newport, R.I., that they would live and pray freely in the new United States. Two dozen leaders of various faiths joined Temple Israel rabbis on stage for moments of prayer on Friday night. “We must work together to heal this world of the hatred, of the bigotry, of the violence that is being stoked in our country,” Markey said. The Friday service followed a vigil the night before at the New England Holocaust Memorial in downtown Boston, organized by organizations including the Boston Workmen’s Circle Center for Jewish Culture, and Social Justice and IfNotNow, an American Jewish progressive group. Friday night was an ecumenical service, as two dozen leaders of various faiths joined Temple Israel rabbis on stage for moments of prayer. They included representatives from Trinity Church in Copley Square and Liz Walker, of Roxbury Presbyterian Church in Roxbury, one of Boston’s better-known black clergy. Representatives came from Old South Church in Boston and the First Presbyterian Church in South Boston. The Muslim imam for the Massachusetts Department of Correction said prayers, as did the senior imam for the Islamic Society of Boston Cultural Center, the mosque in Roxbury and the largest in New England. Jack Curtis, a freelance writer from Jamaica Plain whose two daughters were bat mitzvahed at the temple, said he attended Friday’s service because he knew it would be a celebration of multiple faiths and a diverse community, not only a night of mourning. Zecher said the service was a night of prayer, just like any other Shabbat. But she also stressed that it was time for the community to respond to tragedy with a political message against hate.